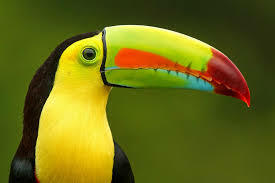 The quirky but beautiful Keel-billed Toucan: the national bird of Belize. A Keel-billed Toucan (the national bird of Belize) made an unlikely visit to my home this morning to eat some palm berries. This was quietly exciting to me because I don’t exactly live in the fast lane these days. 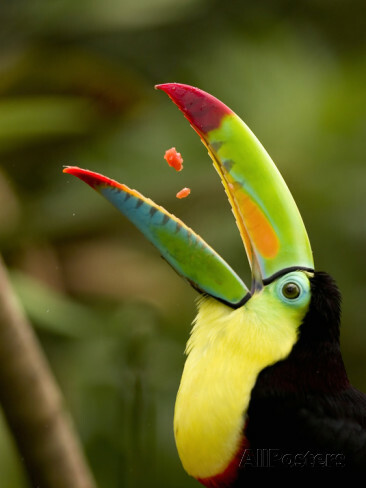 Anyway, I live in town and toucans aren’t town birds. 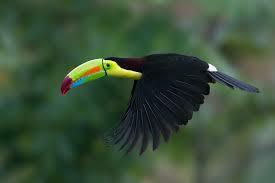 (Now that I’ve said that, I’ll encounter 15 Belizeans tomorrow who’ll tell me they see toucans in town every day. So it always seems to go.) 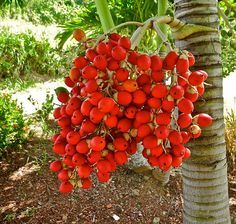 They generally nest and nurture their young high up in the cavities of tall trees where they also get their fruits. Unlike the coconut trees, the decorative Christmas palms outside my humble abode are not tall at all. It hung around quietly for another five minutes or so (I’ve heard toucans “sing” and their singing sounds a lot like a frog croacking), popping an occasional berry before it went sailing off into the distance. Whenever I read about this critter, it reminds me of a cleverly named album ‘Toucan Do It Too’ by The Amazing Rhythm Aces. Ha! I don’t remember that but The Amazing Rhythm Aces were pretty cool.